1. We have 2 reviews of Robert Rotenberg's Stray Bullets, by Bill and Kathy. 3. Carol Shields books in May (Larry's Party reviewed by Anita, and one I'd not heard of before, Swann, reviewed by Raidergirl). Which is a good way to introduce 1morechapter's Carol Shield's Month, starting today. Selections could also count for the 5th Canadian Book Challenge, so why not consider squeezing one in? 4. Speaking of Canadian author challenges, another you could try and double up with your Canadian Book Challenge selections is Darlene's Kelley Armstrong YA Challenge. Armstrong is supposedly visiting Yellowknife in the fall, so I might join this challenge myself. Which brings us to the prize winners of last month's contest. The winner of Jocelyne Allen's You and the Pirates, donated by the Workhorsery, chosen randomly from all those who shared their small press wishlist, is...Pooker! Congratulations! "As human beings, we’ve always told stories: stories about who we are, where we come from, and where we’re going. Now imagine that one of those stories is taking over the others, narrowing our diversity and creating a monoculture. Because of the rise of the economic story, six areas of your world — your work, your relationships with others and the environment, your community, your physical and spiritual health, your education, and your creativity — are changing, or have already changed, in subtle and not-so-subtle ways. And because how you think shapes how you act, the monoculture isn’t just changing your mind — it’s changing your life." Don't forget to add your June review links at the roundup post! I forgot to let you know that I am up to 10 books now. Congrats on the win Pooker!! Of all the books I read, I'd recommend The Town That Drowned by Riel Nason. I loved it when I read it in December and it recently won the regional Commonwealth Book Prize. Picking just one is very difficult. I've read a number of great Canadian books over the past 11 months. My pick is going to be Blank Slate Kate by Heather Wardell. It's a sweet, clean romance that also happens to be self-published. 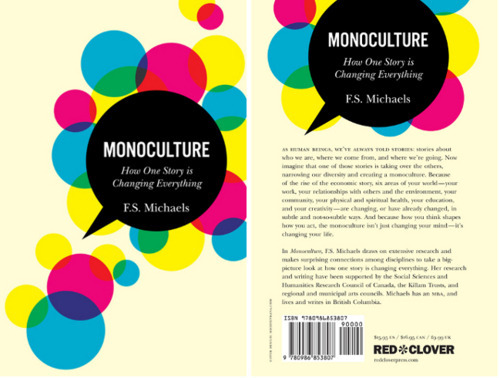 Please don't include me in the draw, because I have a copy of this one, but I wanted to say that Michaels' Monoculture was one of my favourite reads for 2011; it was the sort of book that made me want to buy copies for everybody I know. May went right by without me reading a book for the Canadian Book Challenge. I would say out of books read for the %th Challenge my favorite is The Disappeared by Kim Echlin. I've recommended it to several friends. Thank you John and Workhorsery! You've turned my day around. I admit I had my fingers crossed for this one. I am up to 10/13 now. You and the Pirates arrived in my mailbox yesterday. It came clad in The Workhorsery's nifty handmade cloth book cover. I'm beside myself with delight! Thanks John & The Workhorsery. The winner of Monoculture was Sarah! Congratulations!